Simvastatin is a prescription drug that helps control cholesterol levels in the body by not only reducing the levels of LDL (bad cholesterol), but also increasing the levels of HDL (good cholesterol). Simvastatin has also been shown to lower triglyceride levels. Other common names under which Simvastatin is known are Zocor and Simvacor in the United States, and many other names in various different countries. 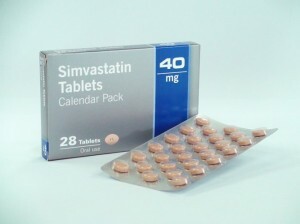 Simvastatin is among many other types of medication in the Statins family that help both decrease LDL and increase HDL. Because of its ability to lower LDL and Triglycerides while also increasing the levels of HDL, Simvastatin is prescribed to patients with coronary heart diseases, diabetes, peripheral vessel disease, and a history of cerebrovascular disease such as strokes. By taking the medication, individuals can lower the risk of fatal and nonfatal heart attacks and strokes. It will also reduce the need for heart surgeries, such as coronary artery bypass grafting, which is performed when there is a blockage in the arteries. While the high density lipoprotein (HDL) or good cholesterol avoids blocking and narrowing of the arteries, the Low density lipoprotein (LDL) or bad cholesterol does the opposite. The LDL is damped in the arteries directly thus clogging and narrowing their size. This causes a heart condition called atherosclerosis. Simvastatin is used by doctors to reduce the production of bad cholesterol and it works by hindering the functioning of the HMG-CoA reductase(a liver enzyme that activates the manufacture of cholesterol). As mentioned above, Simvastatin is in the family of statins that are known to not only lower the level of LDL cholesterol in the blood but also the triglycerides. The infamous statins are also responsible for raising the amounts of HDL or good cholesterol. Low LDL levels and high HDL levels triggered by consumption of Simvastatin can decelerate or reverse the coronary artery disease. What should you tell your doctor before taking Simvastatin? If you are taking other medications including over the counter cures or holistic cures. Follow the exact dosage as prescribed by the doctor. The prescription will depend mainly on the disease or disorder that you are suffering from. It is imperative to avoid buying the drug from a drugstore without getting a proper diagnosis first. Another thing to note is that Simvastatin is not used together with grapefruit juice not to trigger severe side effects. If you skip a dose, take it as soon as you can remember. If it is too close to the next dose you can skip the missed dose. However, you should re-start the recommended dosing plan with the next dose. If you take more doses than required you should call the nearest poison control center. Marketed under brand names like Niaspan, Niacor and Slo-Niacin, niacin is also referred to as Vitamin B3 and is necessary for general health and wellbeing.